Musikalisch kann man dem Namensgeber der Band, Aaron Clift, einen anständigen Background attestieren. Klassik und Jazz sind schließlich Metiers, die prädestiniert sind, um, wenn man sich dem Rock zuwendet, dort die progressive Schiene zu wählen. 2012 gegründet, liegt nun nach "Lonely Hills" aus dem Jahr 2012 und dem 2015er Outer Light, Inner Darkness das dritte Werk vor und vorab kann man attestieren, dass die progressive Schiene nicht die komplette Reise durch gefahren wird. Da sind Weichen im Gleisbett, die ab und an auf Nebenstrecken, wie z. B. den Classic Rock leiten. Das beginnt auch gleich beim ersten Track "Faith", der – nicht unwesentlich durch Aarons Stimme – an eine Mischung aus Jethro Tull und Yes gemahnt. Gitarrenmäßig absolut rockend, sorgt besonders der unterschwellige Yes-Touch für den progressiven Moment. Wird das Gitarrenspiel gebremst, so entstehen Kleinode, die sich voll im Prog-Kosmos suhlen. Als Beispiel nenne ich "Absent Lovers", das verhalten beginnt, rockig auftupft und durchaus per Arrangement auch die klassische Vergangenheit des Protagonisten erahnen lässt. Schraubt sich die Stimme in die Höhe, blitzt wieder der Anderson durch und die eingesetzten Streichinstrumente bringen eine Spur Kansas ins Geschehen. Vertrackte Nummern bzw. Passagen sind selbstverständlich ebenso vorhanden. Allerdings wird z. B. bei "Castle In The Sky" nicht auf Teufel komm raus oder um des vertrackt Spielens wegen so agiert, denn den anspruchsvollen Rhythmen, die vor allem Bass und Schlagzeug an den Tag legen, werden auch süßliche Prog-Tunes zur Seite gestellt. Dass die Musik des Aaron Clift Experiments so breit gestreut wirkt, liegt nicht zuletzt an den beteiligten Gitarristen, denn deren Background ist die berühmte Würze, die einem schon guten Gericht den finalen Schliff verpasst. Da wäre zum Beispiel der Bluesrocker Van Wilks, den man an dieser Stelle wohl nicht vorstellen muss. Arielle dagegen ist eine junge Musikerin, die bei Brian May lernte und mit Eric Johnson zusammenarbeitet. Dass das Mädel flinke Finger hat mag auch daran zu sehen sein, dass sie trotz ihrer überschaubaren Lebensjahre als Opener für u. a. Gregg Allman, Heart, Joan Jett, Graham Nash und Country Joe McDonald fungierte. Auch die anderen Gitarristen sind mit Bedacht gewählt und veredeln "If All Goes Wrong". "Savage In A Fancy Suit" tendiert stimmlich wieder eher an den anderen Anderson; bis Aaron, der neben dem Gesang auch für die Tasten zuständig ist, diese anständig erklingen lässt und eine perfekte Mischung aus Classic- und Prog Rock präsentiert. Wenn ein Stück des Albums voll die progressiven Erwartungen erfüllen soll, dann ist das der Auftritt vom Achtminüter "Dream Within A Dream". Alles vohanden: Stimmung schwankt zwischen Melancholie und Aufbruch, ein Gitarrensolo zum Niederknien, Vertracktes neben purer Harmonie. Eine schöne Nummer. Ruhig, langsam, getragen und – trotz fünfeinhalb Minuten Laufzeit – viel zu kurz, goutiert der Titeltrack die Ohren. "If All Goes Wrong" ist von einem der (für mich) schönsten Instrumente, dem Mellotron veredelt und hat diesen berühmten Duft alter Kraut- und Prog-Ingredienzen. Auch einen traumhaften Gitarrenpart gilt es einzuatmen. The Aaron Clift Experiment is a dynamic progressive rock band based in Austin, Texas. The group’s multi-faceted sound is an innovative blend of classic rock, modern rock, and classical all anchored by the band’s dedication to high-quality songwriting and musicianship. “Intricate and subtle yet with raw passion at its heart, The Aaron Clift Experiment is one of the most exciting and interesting bands currently writing and playing music today,” said Martin Hutchinson of Progradar after first hearing the group. Hutchinson’s enthusiasm has been echoed by other media outlets worldwide, including Prog Magazine, who nominated the band for Best Unsigned Artist of 2013 and for the Progressive Music Award in 2016. 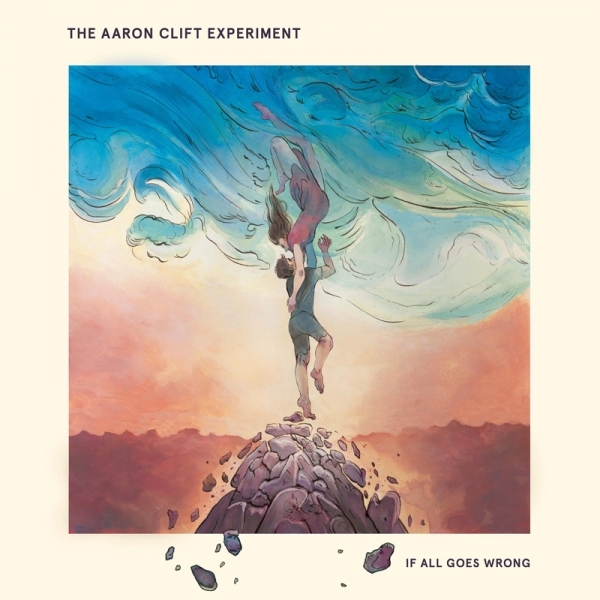 This is a rather different and unusually rocking album from Texan band The Aaron Clift Experiment, with some very hard-hitting themes and lyrics and some wonderful guitar parts from the band and their guests, including Van Wilks, a well known name on the Texan blues circuit and highly respected by the likes of Billy Gibbons of ZZ Top. The first track Faith is dealing with a very smug, self-righteous person seeking to inflict their world view on others and not taking their views into account. This has great guitar from said Mr Wilks, alongside Dave North. Last Crash uses the image of a car crash to show how a partner has consistently hurt and abused them to the point that they want to die, and leave them feeling the pain. This has a very Dream Theater sound to it, along with a complex ascending riff that is employed to great effect. Another hard-hitting track from the band. Opening with a delicate acoustic passage and strings, Absent Lovers creates a softer melody against which keyboards shimmer. The song features another lovely guitar solo offset against violins, not unlike Kansas. Aaron has a very fine voice, one that he uses to great effect on this track. Better Off Before has a sing-a-long factor to it and a Beatles-like melody and a chirpy lead piano with some more fine vocals from Aaron and others. This may be a shorter track, but it shows that this band can do shorter songs justice, without losing their impact. Castle in the Sky offers a great opening lead from Arielle. It offers another complex rhythm part and a riff that twists and turns like a Texas sidewinder. It is refreshing to hear such exuberance in a song. I‘m very impressed by all that I‘m hearing on this disc: great songs, good subject matter and wonderful playing from all involved. There is much to admire here, and most prog fans will find much to savour. Savage In A Fancy Suit has a very King Crimson-ish groove to it, with some great keyboards, especially the organ part. I always think that albums need time to breathe and gain importance and si gnificance, and that is most certainly the case here. The more you listen, the more you hear, and the better it sounds. Dream With A Dream is another epic track, opening with a very melodic guitar line from Kevin Chin, after which come some sultry keyboards and Aaron‘s impassioned vocals which speak of the sea and its churning, drifting and shifting tides. A nice bass part drives this song forward with some very tasty ensemble playing. It is a massive song and very impressive too. The penultimate track, Wild Hunters has another very strong opening guitar motif. This is a very short, punchy track that is vastly improved by the guitars. The final song, If All Goes Wrong, is a more mellow song to draw things to a conclusion, as it calls for a love to be there if all goes wrong. This is a very heartfelt song with a simple yet very effective premise. At the 3:35 marks comes another guitar line right out of Robert Fripp‘s bag. It is very Crimson-esque in its sound, timbre, tone, and style. It is another really great piece of guitar playing and one that certainly makes you sit up and take notice as it brings the album to a magnificent, emotive and hopeful conclusion. Overall this is a superb album and one that will probably be in my best albums of 2018 list. A tremendous piece of progressive rock that deserves a wide audience. An album that is well worth searching out.